This term, we will be reading and exploring the book 'Lili' written by Wen Dee Tan, a Malaysian born author. 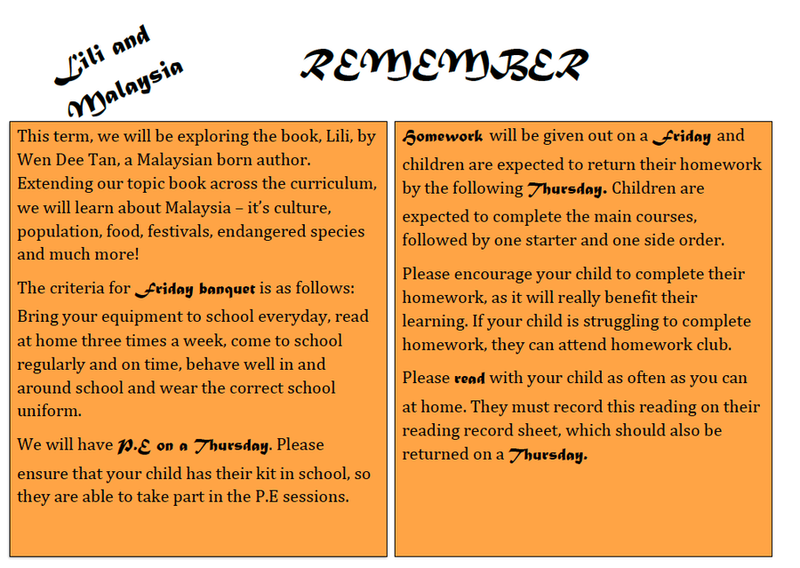 Extending our topic book across the curriculum, we will learn about Malaysia. As part of our science topic of life cycles of plants and animals, we have planted our own peas - we are looking forward to seeing them grow this term! In English, we have been looking at instruction texts and in line with our topic we cooked our own Malaysian Chicken curry from scratch and enjoyed it with some naan bread! In maths, we have been learning to multiply using formal methods. Earlier this week, we were multiplying using the ladder method and we moved onto long multiplication using the grid method. We have been practicing our times tables lots. In computing, we started to explore scratch and are looking forward to creating and developing our own games. This week, we went on a fantastic trip to Fleet Air Arm museum - we attended a War on the Home front workshop, made gas mask boxes and re-enacted a evacuation with the sirens and the lights turned out! We went on a helicopter simulator, walked through a concorde and saw some of the earliest planes and aircrafts. In maths, we have been recapping subtraction with whole numbers and decimal numbers including exchanging. At the end of the week, we solved word problems involving addition and subtraction and particularly focusing on the language used and which operation was needed. In English, we have been writing descriptively about Lili and the village children - we have considered the feelings of the children and Lili and created some brilliant freeze frames and short drama productions through the representation of a picture. This week, we had M and M productions come into school and perform Hunchback of Notre Dame. We absolutely loved it and can't wait to take part in the enrichment activities in the coming weeks! HAPPY NEW YEAR from year 5! We have had a fantastic first week back. In English, we have been looking at our new book - Lili. On Tuesday, we looked at the front cover and let our imaginations run wild! We talked about what the book might be about and we asked questions about Lili, ranging from what her personality was like to whether she had super powers! We then wrote stories in groups about Lili and came up with some fantastic ideas. Over the course of the week, we did some guided reading and lots of activities around the book. In maths this week, we have been recapping the place value of seven digit numbers and column addition. We also did lots of word problem work. We had great fun playing place value 'who wants to be a millionaire' and we reached one million pounds! 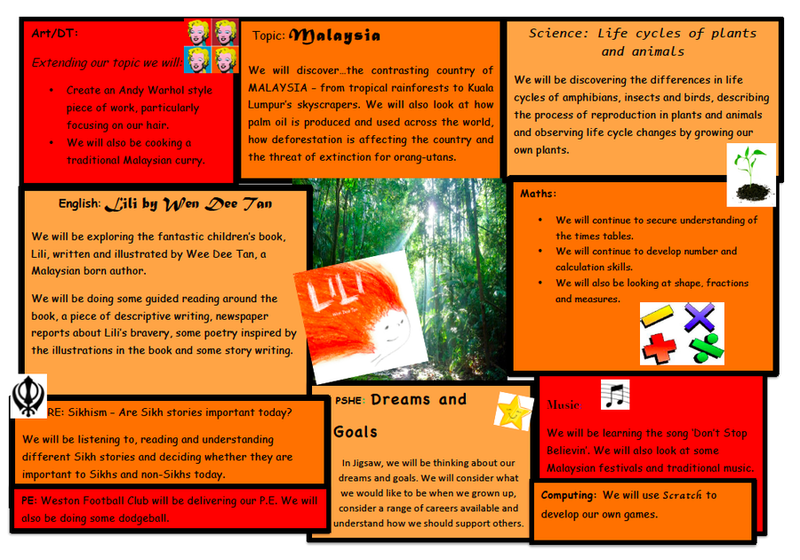 In topic this term, we are looking at Malaysia; this week, we looked at the contrasts within the country - from hot and humid rain forests to the sky scraper of Kuala Lumper. We imagined we had visited the country and sent postcards home to our loved ones. In R.E this term, we are looking at special Sikh stories. We talked about books that are special to us in preparation for this term. In Jigsaw, we discussed our dreams and goals for the future and how we can achieve them! We are looking forward to our trip next week to Fleet Air Arm Museum - pictures to follow!